If you haven’t been living under a rock, you must be aware that Microsoft just officially announced that it will acquire Github for a massive 7.5 Billion dollars. 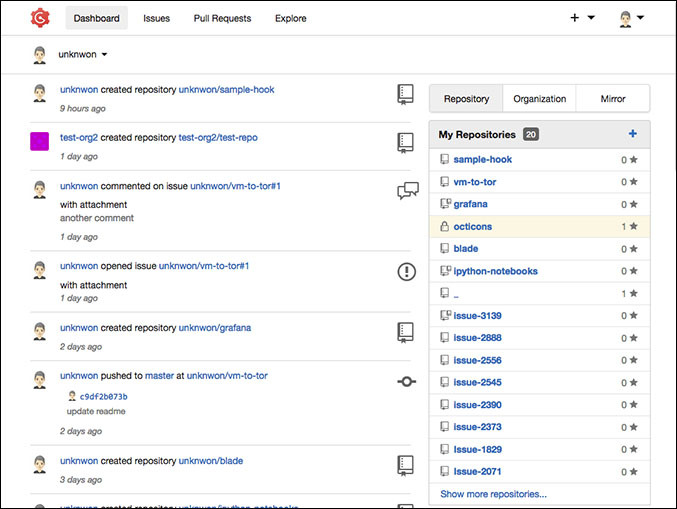 Github, the world’s leading software development platform is home to over a gazillion open source projects used by over 28 million developers. 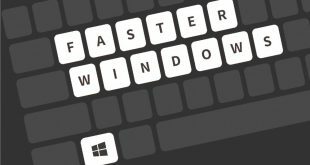 Given Microsoft’s history of abuse and strong feelings against open source communities, the news has made most developers uncomfortable and many have since been itching to flock away to a new repository hosting service or website. So whether you are someone looking to migrate your open source projects or install a version control service on your own server, we take a look at some of the best Github alternatives today. 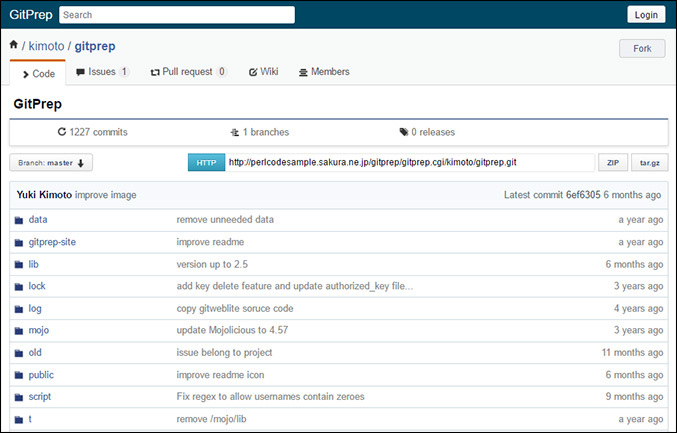 Gogs is an open source and completely free (ironically hosted on Github itself) self-hosted Git service. Being written in the Go programming language, Gogs can be run anywhere, Go can be compiled i.e. 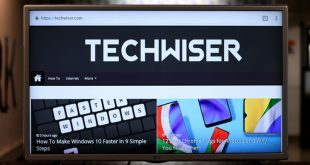 Windows, Linux, MacOS, ARM, etc essentially making it cross-platform. It is also very easy to get started with; download the binary for your specific platform and run it or you can even ship it with Vagrant or Docker, or get it packaged. Quick Tip: If you like Gogs, you might also want to check out Gitea, which is a fork of Gogs managed by a whole community to which you can also contribute. It is another free and light weight code hosting solution. SourceForge is one of the oldest software development platforms among that are available today. It has been home to loads of open source projects and source code repositories since 1999. Developers familiar with Github might find the project structure and the overall UX a little different (some might even call it ugly); for starters, your projects or repos need to have unique names as you can create a webpage for each of your projects with the domain name same as that of your project name for which the names need to be unique. 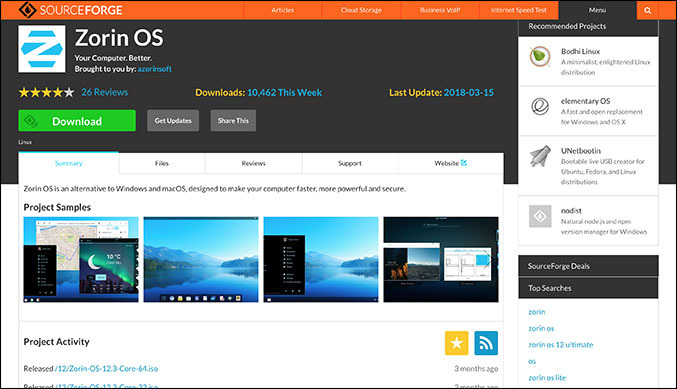 Also speaking of webpages, with SourceForge you have the option of hosting static as well as dynamic pages for your projects and with the extra option of including a CMS too. BitBucket is not only an awesome alternative to Github but also the best Gitlab alternative. It has also been around for almost the same time as that of Github. It is a repository hosting service provided by Atlassian which is the parent company for also Jira and Trello. Bitbucket comes free for up to 5 users and offers unlimited private repositories which makes it perfect for personal and scholar projects. Like Github pages, it also has support for pages and Atlassian also has a Git and Mercurial client available for free on Windows and Mac. Besides its extra features like Code Aware Search, CI/CD, you have the option of integration with Jira, Trello and Slack. 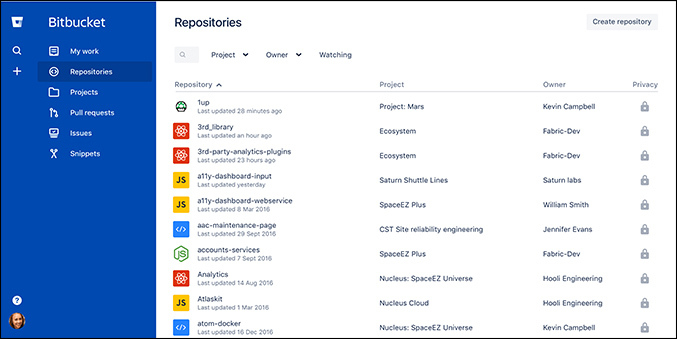 BitBucket is also pretty flexible, as it can be deployed in the cloud, on a local server, or your company’s data center. With all the developers planning to or moving away from Github, Gitlab has probably got the best response among all the alternatives and rightfully so. GitLab has a wide range of pricing options with extensive features even in the free one, like built-in CI/CD, time tracking, issue boards, code review, wiki/documentation and also GitLab Pages. The Community Edition is open source and free and gitLab can also be installed on your own server. Gitlab is able to handle large and rich repositories with ease and also provide unlimited public and free repos. Overall, it is a very well polished and reliable git repository hosting service. All of this has made it the most popular alternative and GitLab has also capitalised on this by just announcing that GitLab’s Ultimate and Gold Plans will now be free for open source projects and school. 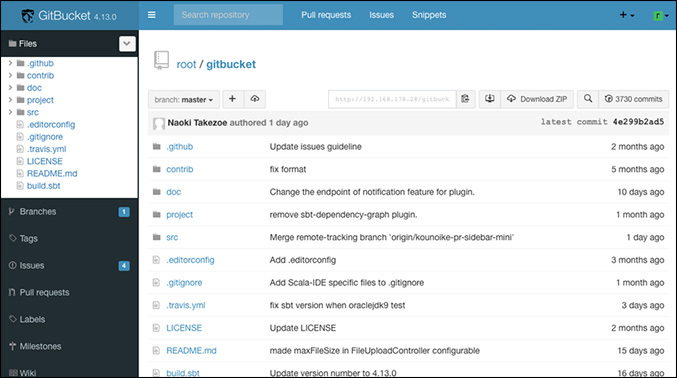 GitBucket is an open source Git platform powered by Scala. It is a Github clone and has a similar user interface and perks of that of Github like using Ssh and HTTP for hosting Git repositories, pull requests, wiki, issues and repository viewer. GitBucket also has a nifty feature of supporting plugins. The addition of plugins make it unique and the project being open source is always open to contributions. Some of the popular plugins include Commits Graph Plugin, Jupiter Plugin, Gist Plugin and a plethora of others. It also boasts of the most powerful API compatibility to Github.com/GitHubEnterprise. Kallithea is another free and open source repository management system which supports both Git and Mercurial(Hg), the two leading VCS. It provides a web interface that is convenient to use for starters and admins which supports online collaboration as well as code review. The UX is very different from that of Github but very light and fairly easy to get used to. Kallithea can be installed on any server and be used to host multiple repositories for either Git or Mercurial, whichever you prefer and it also supports LDAP, which makes it a lot easier to use your already existing authentication system. Back in 2006, Google had launched Google Code, a new version control platform which was hosted on its vast cloud servers. While it was a huge failure and now has been closed off, Google didn’t lose hope and have since then moved to Google’s Cloud Platform. 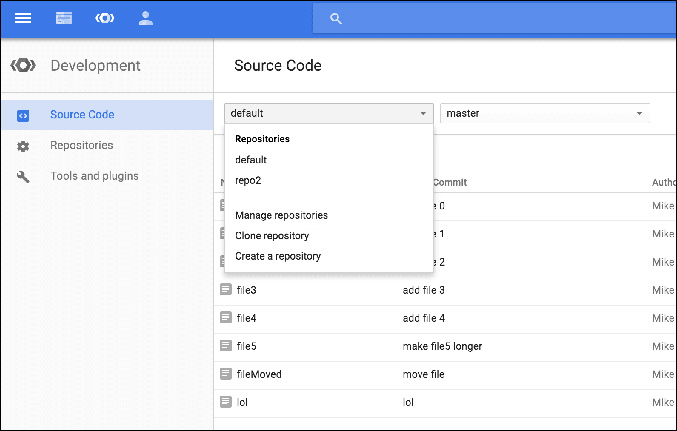 The great thing about the repositories or Cloud Source Repositories(CSR) is that they do not use the new VCS of Google Code but support Git and you can also connect your Github or BitBucket repos along with your CSR. Given Google’s infrastructure and Cloud Platform support, you get multiple features like Cloud Diagnostics, Stack-driver Debugger to name a few. What’s better is that it is priced extremely competitive to Amazon’s AWS and you can try it for free for 1 month. AWS or Amazon Web Services is a cloud computing platform provided by Amazon like Cloud Source by Google. AWS has a CodeCommit platform which you can use to host your private Git repos securely. AWS CodeCommit becomes a no brainer if you are using other AWS projects as you will be able to connect them easily to your workflow. 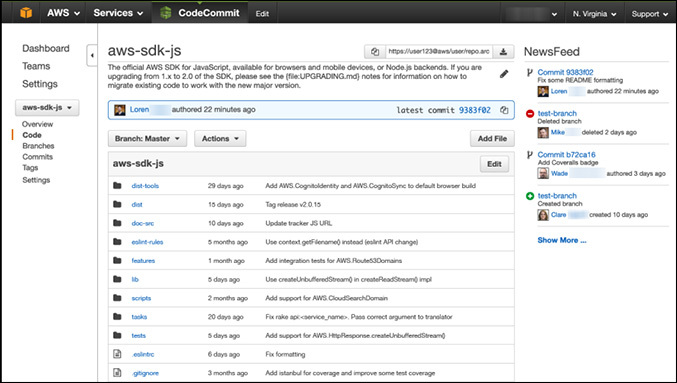 CodeCommit can even be used with your current Git tools, but the code is hosted securely in the AWS environment. The AWS environment is secure and scalable as there is no hardware to purchase. 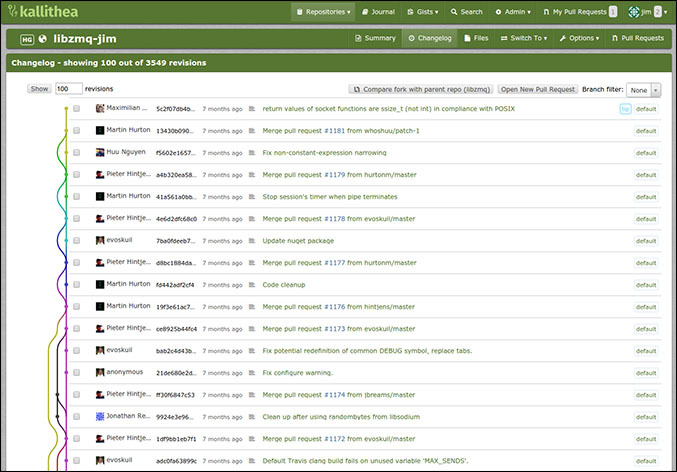 GitPrep is another Github clone which also happens to be open source and completely free. It has the exact same interface as that of Github, so if you are coming from Github you will feel right at home with this. GitPrep is brand as a “portable Github system” as you can install it easily on your Unix/Linux server just by mere two commands. It has a built-in web browser, smart HTTP support, support issue system and also SSL support. 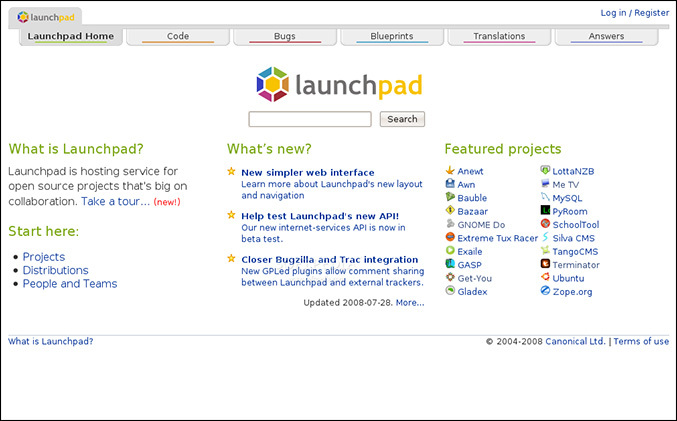 Launchpad is a software collaboration platform provided by Canonical. As you might know Canonical is the parent company of Ubuntu and Launchpad has been and is used primarily for Ubuntu related projects or Ubuntu related software by providing Ubuntu package building features like bug tracking and PPA. But still, you can use it to host any of your projects and it is free to use for open source software projects. For private projects, Launchpad offers private teams and mailing lists, private PPAs and private code branches. Launchpad supports Git, CVS, Subversion and also Canonical’s VCS Bazaar. 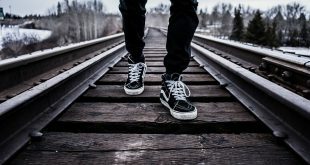 While we still are not sure what Microsoft’s ulterior motive behind acquiring Github was or about the future of Github, these were the top 10 alternatives to Github broken down and compared with respect to features, pricing and platform. GitLab and BitBucket seem to be the most popular options by far but there’s no harm in checking out some of the free alternatives considering both of them are freemium options. Anyway, which platform or alternative are you using or are you just sticking to Github? Let us know in the comments below.